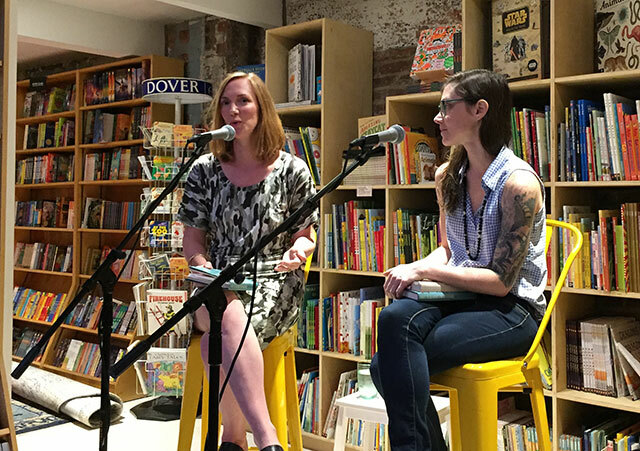 Bethany Ball was at Books Are Magic to discuss her new novel, What To Do About the Solomons, with Sarah Gerard, who recently released an essay collection, The Sunshine State. What to do About the Solomons follows a family as they navigate life on an Israeli kibbutz. The narrative reveals through assort memories collected stories and myths of the kibbutz. Asked about research for the book, Ball, says she is married to an Israeli and lived for a time on a kibbutz. She found the experience fascinating enough to want to write about. During that time she had heard many different stories from the kibbutz residents, and so researching the book for her meant taking time verifying some of these narratives. “I became obsessed with kibbutz life,” she explains. Once she began writing the book, she did travel back and forth to Israel, but more often to see family than to do any specific research. Still, she did work towards confirming the stories she had heard. One element of the kibbutz that she noted was that the children’s books often had the look and feel of Soviet era books. They were stories of cherubic farmers and laborers working together to build a society–and it did turn out that it is likely these farmers did originate in the Soviet state. The book began as her MFA thesis. The MFA system tends to preference stories which can fit within the confinement of a workshop. Her thesis included four stories that were not at all connected, and these became the foundation of the novel when Ball decided to write the connecting pieces. “I thought my subject was going to die before I finished the essay,” Gerard says of a formerly homeless man she had been interviewing. He had been sick and ended up in the hospital at one point. There are two characters Ball sees herself as cheering on throughout the novel, yet they are also both constantly breaking down. Because the novel started off as short stories, Ball was able to focus on small sparks for inspiration. Linking the stories felt like a mystery she was solving. She wanted to find out how these characters all connected. With her new project, she plans to write it as a novel from beginning to end.